Pets Costs > How Much do Alligator Snapping Turtles Cost? How Much do Alligator Snapping Turtles Cost? The alligator snapping turtle is one of the largest freshwater turtles in the world and is very distinguishable from other types of turtles: They have large heads with strong, beak-like jaws and spiky ridges running along their shells. Because of this primitive-like appearance, these turtles are usually associated with dinosaurs. Although they are most at home in deep, muddy holes in the rivers and streams, they can adapt to different environments since they are amphibians. These amazing creatures can be found anywhere from Georgia to Indiana. How much does an alligator snapping turtle cost? The cost of an alligator snapping turtle will depend on the age, size, quality and where you purchase it from. The average price of an alligator snapping turtle is usually between $40 and $75 for a baby; however, if you were to purchase more than one, discounts, up to 30 percent or more, may apply. Alligator snapping turtle eggs can cost anywhere from $250 to $350 each. A few members on TurtleTankSetup.com talked about how to find an alligator snapping turtle and what you should expect to pay for one. According to the responses, most said you should be prepared to spend $60 to $100 for a baby and about $45 for next day shipping, bringing the total to about $100 to $150. Because this type of turtle is native to certain parts of the world, they will be cheaper in their native area. The further you are from the source, the more expensive the turtle will be for you since you may more than likely have to pay the shipping fees. Alligator snapping turtles can either be born in captivity or born in the wild. They can also be born before or after they have been hatched. Turtle eggs from the wild will be the most expensive, while live turtles born in captivity will be the cheapest. Local pet stores may have this type of turtle for sale; however, according to a few shops we called, the selection was very limited; in fact, most didn’t and wouldn’t carry. Most of the time, you will either have to purchase online via a reputable breeder or you may need to have it special ordered from a local pet store. An alligator snapping turtle, being the largest freshwater turtle in North America, can weigh up to 300 pounds and reach more than 25 inches long. Although the lifespan has yet to be confirmed, like most turtles, they are believed to live 80 to 120 years if taken care of properly. If you buy the turtle online, you will be responsible for the shipping costs. Next day shipping fees, on average, is about $45 to $65. These prices may change from one breeder to another and may depend on your location in the country, but this should be a rather good estimate to keep in mind. These are not domestic animals, and they need a special cage and a shelter similar to their natural habitat. Although they can adjust to most temperatures, they prefer cool swampy places, and the temperatures should be 75 to 80 degrees. Alligator snapping turtles, when kept in captivity, are fed fish, mice, worms and a nutritionally balanced diet. Plan on spending around $100 per month on food alone. Although they bear the name of snapping turtles, alligator snapping turtles are totally different. They are not as aggressive and have a milder temperament. Alligator snapping turtles are protected in all 50 states, and these protection laws make commercial trapping illegally. Most, when trapped, are usually done so for the meat. These turtles are a bit expensive since they do not lay eggs every year. Experts say they lay eggs every other year, and sometimes, depending on the circumstances, every third year. 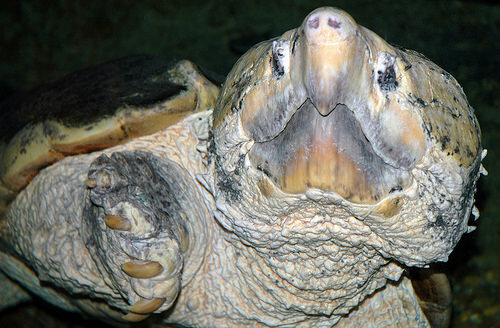 Alligator Snappers are the largest freshwater turtle in North America. According to the Office of the Federal Registrar, some restrictions are set when selling, buying and owning this type of turtle. Shop around (both in stores and online) for the best deals of alligator snapping turtles. However, do not just consider the cheapest option. Make sure the pet store or breeder has a reputation of complying the standards set by wildlife agencies and your local government.